Life at Squam is idyllic and beautiful even when it rains. While I had my iPad with me, I didn't take any pictures. I just immersed myself in craft, beauty and the feeling of nature all around. This was the first year I could really say that I worked past my comfort zone. For the past two years I've taken knitting and embroidery, but I wouldn't say that the classes I took were mentally challenging. The challenge was just in being at Squam and meeting new people and being open to meeting people. Last year my cabinmates were both stronger at sewing and as a group we decided to expand past our comfort zones. This year instead of knitting I took Card Weaving with John Mullarkey and Squam Smock with Cal Patch. Now, I have done weaving before on the rigid heddle, but I have been reading about tablet and card weaving for a few years now and thinking that the online instructions were a bit hard to understand. So, card weaving wasn't quite as far outside my comfort zone. I mean, it is still playing with string. But sewing? For me even with a good teacher I don't always feel comfortable seeing the next step, and so I spend a lot of time confirming that the thing I am pretty sure I am supposed to do next is really the thing I'm supposed to do. Squam Smock wasn't really that much different in that regard, but I was able to move a bit past asking about everything and to just do some of the things. My only regret is that I didn't have the time to trace out the pattern so I could make another one. The pattern is easy and flexible enough (without the pockets) that I think I can make it again without feeling like I need hand holding. And well, it is definitely roomy enough to take me through pregnancy and not-maternity enough to wear afterwards without feeling like I am in a moomoo. I did combine a few things together this year. I embroidered my fabric, to draw on my skills from last year. I am also hoping to card weave a band to sew onto the bottom. It would be nice to be able to wear it to Squam next year (I hope I'll be able to go) and see the different elements all together as a single whole. 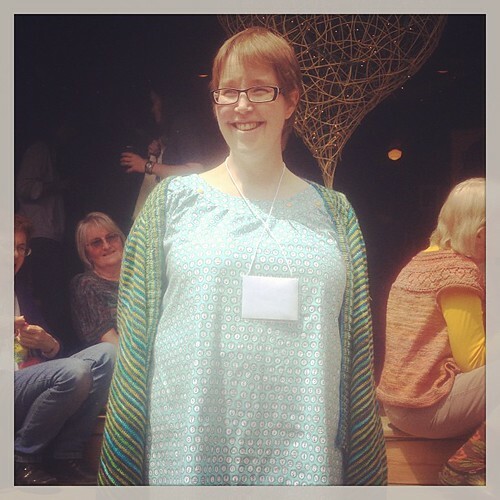 Oh, and yes, the sweater is my Breezy Cardigan, which I finished only a few days before Squam. It still needs a separate reveal, but it worked well in the mixed weather of Squam Lake in the spring.